When it comes to invitation card design, wedding invitations have a special place. Unlike other types of designs, a wedding invitation has to look and feel unique, much like the wedding itself. One of the most important parts of designing such a wedding invitation is choosing the font. The design and the style of the font you choose for the wedding invitation will determine its overall look. In this case, you should try to avoid the normal serif and sans-serif fonts, especially the default fonts in your computer. Instead, look for a better and premium font with a unique design. In this collection, we feature a handpicked collection of the best fonts for wedding invitation designs. Whether you’re going for a formal, informal, or a quirky casual design, you’ll find plenty of choices in the list of fonts below. Humble script is a beautiful calligraphy font that features all the right elements you’ll need in a wedding font. It features a great flow that perfectly interconnects all the letters together. The font also comes with a handmade design, which will make your wedding invitation stand out from the crowd. Wonderfebia is a creative wedding font featuring a modern calligraphy design. It includes both uppercase and lowercase letters as well as stylistic sets, swashes, and much more for crafting a beautiful wedding invitation. At first sight, you’ll see how this handmade font can be the perfect choice for a wedding invitation. It comes with creative OpenType features including standard ligature and stylistic sets for crafting unique designs. Just like a butterfly, this elegant script font also features a smoothly flowing design that will fit perfectly in a wedding invitation design. The font comes in two versions: Regular and bold script, which you can combine together to create a beautiful design. 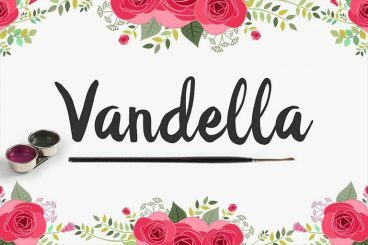 Vandella is a hand-inked script font that features a unique look. This font is ideal for making a wedding invitation with a casual design. It includes both uppercase and lowercase letters along with numbers and symbols. Annisa is a handwritten font featuring a minimalist design. If you’re working on a wedding invitation with an informal design, this font will be a great choice for you. It comes with regular and slant versions of the font. Madeline is a unique script font featuring a handcrafted design. This font will not only make your wedding invitations look one of a kind but it will also add a bit of personality to it as well. It includes stylistic sets and alternates as well. Bird House is a modern script font featuring a casual design. This font is perfect for making a modern and unbiased wedding invitation design. The font also comes with multilingual support. This creative calligraphy font is perfect for crafting a modern wedding invitation with a feminine design. It features stylish swashes and uppercase alternates, ligatures, and much more for designing beautiful invitations. Amelia is the perfect font for designing wedding invitations with a casual look. The font features a minimalist design with a modern calligraphy look. The font will look great in greeting card designs as well. This creative font comes with a unique design of its own, making it a great choice for designing fun and quirky wedding invitations with personality. The font comes with 6 typefaces, including regular and script fonts as well as with swashes and alternates. At first sight, you can see this font will look great in golden foil. The font comes in 3 styles: Regular, decorative, and serif. You can combine these typefaces to create a beautiful wedding invitation. If you’re working on a wedding invitation design with a vintage look and feel, this font will come in handy. It features a classic vintage design with a script design. It will certainly class up your invitation design. Rumble Brave also features an elegant modern-vintage design. It’s ideal for making modern wedding invitations with a vintage design as well as for golden foil prints. The font also comes in multiple versions ranging from outline to shadow, rough, and more. Another classy vintage serif font that’ll look great on wedding invitation designs. This font comes in 2 styles, regular and italic. It also includes multilingual support and OpenType features. Hunter Skyfar is a creative brush script font featuring a modern design. This font is most suitable for wedding invitations with casual designs. The font includes OpenType features such as stylistic sets and alternates as well. Just Hello is an elegant wedding font that comes with lots of swirly characters you can use to design unique wedding invitations. The font comes with many useful OpenType features and stylistic characters. This font is perfect for crafting informal wedding invitations with a casual look. It comes with multiple versions, including bold, shadow, and varsity typefaces. The font also includes multilingual support as well. Olivia Sand is a creative typeface you can use to design wedding invitations with a feminine design. The font also comes bundled with 21 watercolor flower designs in PNG format, which you can use in your wedding invitation design. Aurelie Smith features a signature design, which will fit perfectly in a modern wedding invitation design. The minimalist design of the font will add a unique personality to your design as well. Halimatun is a handwritten font that’s most suitable for designing modern wedding invitations with a casual look. The thick design of the characters is ideal for highlighting the names in a wedding invitation as well. This is an all-in-one bundle of hand lettering fonts, which includes 6 different fonts with dingbats, more than 100 unique illustrations, and much more you can use to design a complete wedding invitation design. With this bundle, you can mix and match different styles to create unique designs of your own. For more inspiration, check out our best cursive and script fonts collection. Every wedding deserves a beautiful design. Your special day should be accompanied with stationery, cards, invitations, and a website that reflects you both as a couple. This series contains inspiration, tips, and ideas for designing everything you need for your wedding day!